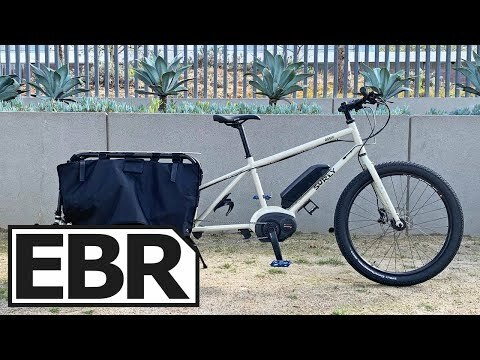 https://electricbikereview.com/surly/big-easy/ The Surly Big Easy is a Bosch powered electric cargo bike from Surly with a long tailed design, a steel frame, steel fork, and am aluminum alloy platform rack in the rear. Powered by a Bosch Performance Line CX mid-drive, a PowerPack 500, 11 speed SRAM GX derailleur, and rounded off with Tektro Orion hydraulic brakes. Purpose built for action and loaded with possibilities, it really speaks to the adventurer ready to start a rugged tour or have some fun camping, can also be used around town and in many other situations. Since the bike appeals to a certain consumer, it may put off those looking for a typical cargo bike that serves more like a family van, it is also missing some features like integrated lights, a deflopilator, a slap guard, and doesn’t come with pedals.